In our adventure so far, we have managed to see and talk to a few sailing vessels. 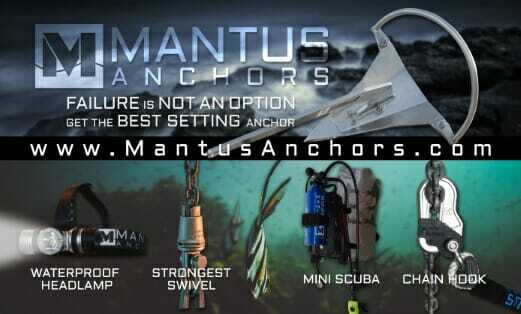 Maybe we see them on the horizon, maybe we are docked with them, or maybe only on our AIS. Either way, we’ve been writing down the names, and I spent some time looking up these boats now that we have internet! I was pleasantly surprised to find a very special project and blog that happened on Seabbatical MMXV, an Australian Lipari we met in La Rochelle. We met the owner, Owen, and I knew he had a timeline to stick to, but we didn’t know why! Turns out, Owen’s son and nephew (Finn and Will) were joining along with the other dad and one other person to cross the Atlantic to raise money for cancer research. 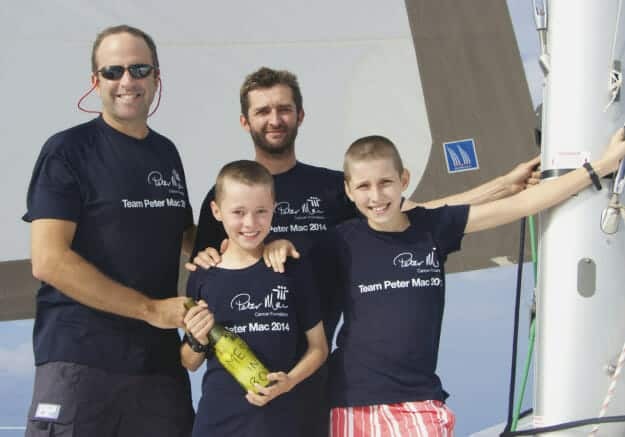 Their blog is a great read from the boys’ perspective, and they were successful in raising over $22,000 AUD for the Peter MacCallum Cancer Centre! The boys Will and Finn and their dads. Owen, who we met in La Rochelle is on the right. 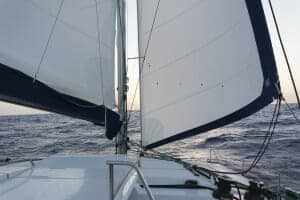 I thought it would be fun to point out the differences in our Atlantic passage – most of these things we are jealous about, but not the seasickness or the forks! They saw a pod of orca whales. They caught 9 fish! We are jealous of the tuna and mahi mahi they enjoyed. They went for a swim! They sent out a message in a bottle – great idea! We didn’t think of it until we hit the Bahamas. They accidentally lost all their forks except for one overboard. 5 people sharing one fork! It sounds like they had quite the time and we are impressed by the boys! I always wondered how Ariel got her Dinglehopper!!!! Thank you for telling us about their journey. PS, If you’ve never watched The Little Mermaid, Ariel combs her hair with a fork and calls it a Dinglehopper. Haha! That is a very good point!